You could do it yourself. Get a cheap electric machine from the hardware shop, plug it in and go! You’re using electricity and water together. While generally this is ok do you want to run the risk of electrocuting yourself? And what about how dirty you’ll get and the time you will spend? Roof cleaning: Keeping your roof clean is a simple and affordable process. There are a couple of ways that a roof can be cleaned! The old way which causes damage to the surface is to use high pressure cleaning. The Pressure Clean Experts use a much more effective and safer method: Soft-Washing. This process makes use of chemicals to thoroughly clean the surface for a longer lasting finish . Soft-Washing doesn’t damage the surface so it’s better for your roof. House Washing: Along with the inside of your home, the outside should be kept clean too!Using the latest technology, TPCE will Soft-wash your home with low pressure. This approach is much better for the walls of your home and is particularly effective in removing mould and spiderwebs. Driveway cleaning: Make sure your driveway is not slippery.Tradtional pressure cleaning is still the best method for cleaning your driveway. 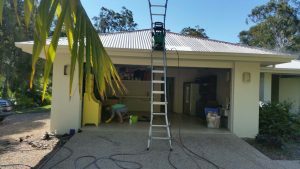 As you’d expect, The Pressure Clean Experts has top quality, commercial equipment to make sure that your driveway and other flat surfaces are brought up to the highest standard. Driveway Sealing: Protect your concrete surfaces with a complete clean & seal. While sealing a driveway will not prevent the return of mould and dirt, it will make your maintenance cleaning much easier. Fence & Wall cleaning Walls and fences are often a feature that get covered in mould! It’s a simple matter to put this right for you! Depending on the structure, a traditional pressure clean might be needed.. In most cases however, you can expect to see a great result with Soft-wash.
Deck & Pergola Cleaning:Your entertainment areas can also benefit form a thorough clean. Most of us spend many hours entertaining in our outdoor areas. Your pergola roof is likely to be stained with mould and mud wasps! These can be safely and effectively removed with our Soft-Wash process. When you call us, the one of our team will phone you back. You are not dealing with an office off-shore or out of the area. If you have questions, they will be answered. It is best to visit your job to make sure we have all the information to provide you with an accurate quote and answer any questions you may have! Sometimes it may not be possible for you to meet on-site. If this is the case we endeavour to make sure that everything is covered in the initial phone call! 1. Free onsite inspection and detailed quote. 2. Organise a suitable time and day for the work to begin. 3. Confirmation email from The Pressure Clean Experts the day before arrival. 4. Arrive on time, complete the work specified. 5. Final clean up and cleaning report provided.